The Mortuary Chapel of Menna (superintendent of the estates of the king and of Amen, at the middle of the 18th dynasty). In the top row from left to right, a slave is seen kissing the foot of the overseer, the lands are measured by means of a rope, from which the knobs, that assured the correctness of the measurement, have been struck out by the avenger, in order that Menna may never again count his acres. 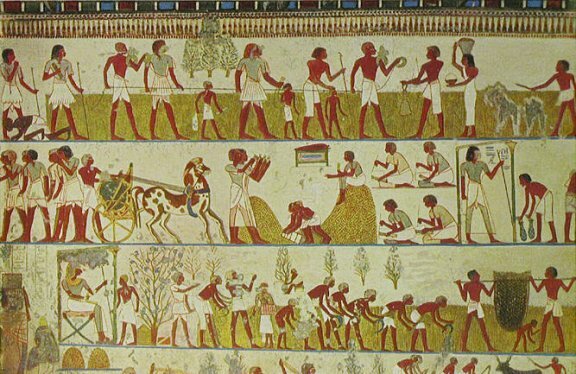 In the second row, Menna's chariot and servants await to carry him to his fields, the quantity of his grain is recorded by the scribes; Menna stands under a canopy while servants bring him drink. In the third row, Menna sits under a canopy, outside of which is a tree with birds-nests built in it. Scenes of reaping follow.